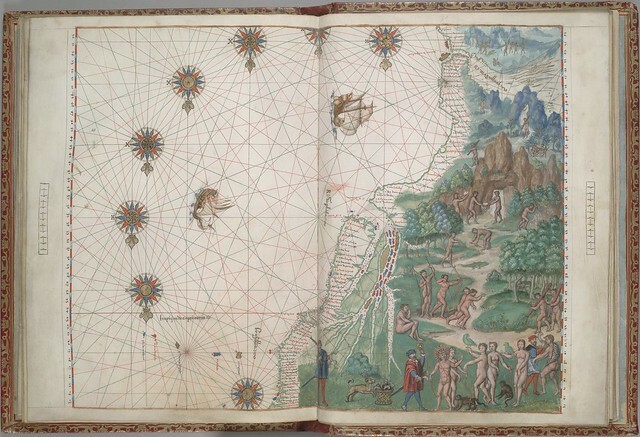 Allegedly, this atlas shows the first ever European record of Australian coastline -- some 250 years ahead of Capt. 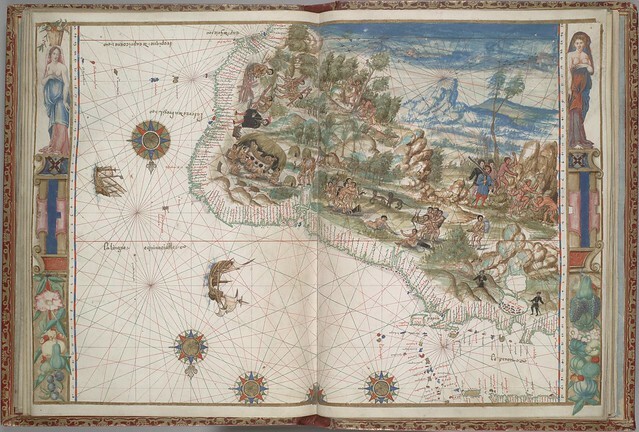 Cook and 60-odd years before the earliest official European discovery/sighting/mapping of any Australian coastline by William Janszoon in 1606 [see: Landing List]. 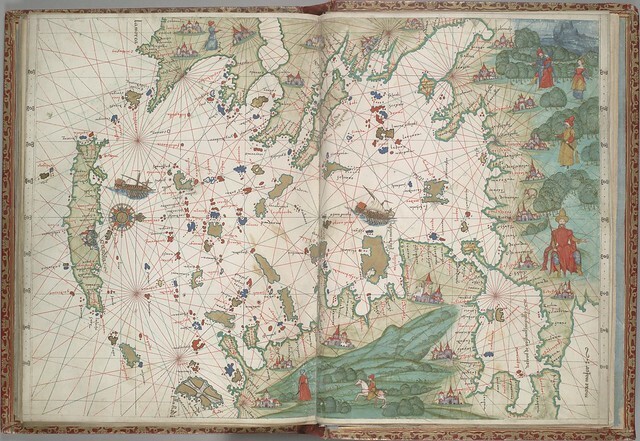 To be honest, the attraction of this atlas, for me, rests with its unique aesthetic properties rather than in the folkloric dimension it *may* play in the mapping history of the Australian coastline (I don't think the evidence is conclusively persuasive) . If anything, I'm a bit miffed that I didn't grow up speaking Portuguese, which seems far beyond my meagre linguistic talents these days. 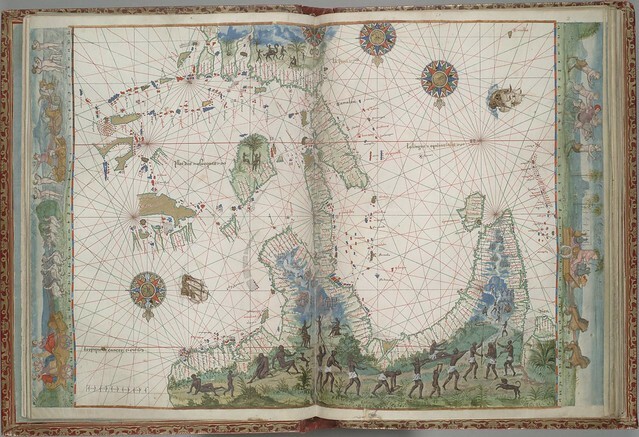 VIA "The Vallard Atlas is a magnificent portolan atlas, one of the bibliographic treasures of sixteenth century Europe. One of its most noteworthy characteristics is the miniatures depicting countless illustrations of the daily life of the native population in every territory. 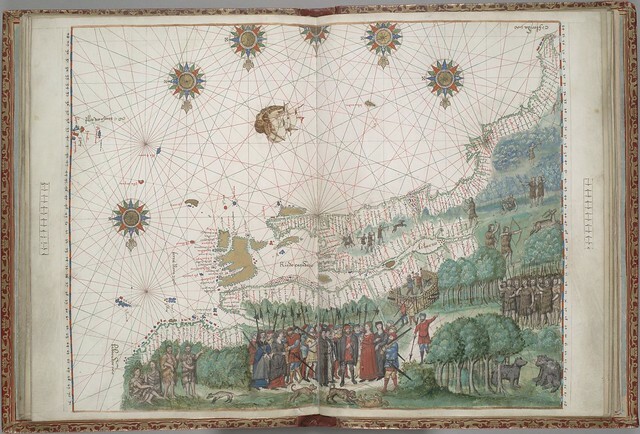 The Vallard Atlas, whilst ascribed to the Dieppe cartography school, has a clearly Portuguese flavour due to either its anonymous creator or the model that inspired it." 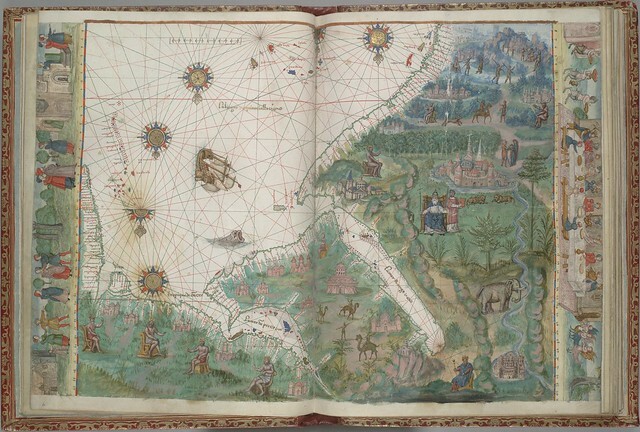 HM 29 Vallard Atlas is owned by the Huntington Library in San Marino, California and is hosted online by the Digital Scriptorium Database. The HM 29 manuscript guide. Theory of Portuguese discovery of Australia - a fairly comprehensive article on Wikipedia. 'Beyond Capricorn: How Portugese Adventurers Secretly Discovered and Mapped Australia 250 Years Before Captain Cook' 2007 by Peter Trickett. 'Java la grande: The Portuguese discovery of Australia' 1984 by Lawrence Fitzgerald. 'The Secret Discovery of Australia: Portuguese Ventures 200 Years before Captain Cook' 1977 by KG McIntyre. 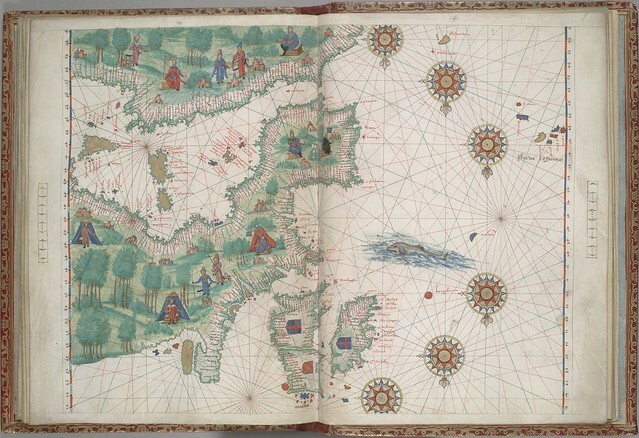 M Moleiro in Spain produce a very high class facsimile edition of the Vallard Atlas. 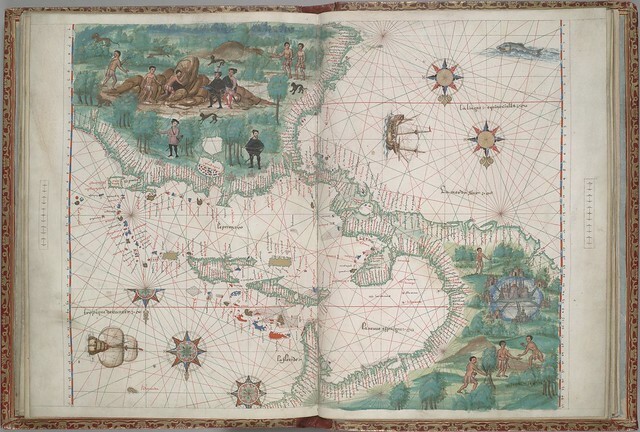 Actually, that last map is of the Caribbean Sea, Antilles, and New Spain. The book is magnificent! Thanks, yes, I believe you are correct (it took me a while to come around but "New Spain" and "Bahama" had me). I was just going by the named title at the Berkeley site. Cheers. In fact, the titling mistake is only in the image collection. 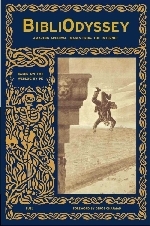 The Manuscript guide has the correct title (folio 10). I have to say this has been my favorite post on here recently. Fascinating!